This recipe is a bit costly to produce for only 4 servings. However, it is also delicious and refreshing. I imagine this would be perfect for runners at the end of a long marathon. The flavour combination of aloe, cucumber and mint makes my taste buds sing! For someone who works with sugar and chocolate for a living; this recipe makes me feel fresh, healthy and quenched. With a sharp knife, trim a 1/4 inch off either side of the aloe vera leaf. (The sides with the small spikes). Remove the remaining green skin on either side of the leaf, leaving only the aloe vera jell on the inside. The jel is clear, however there may be a yellowish substance that clings to it. Place the aloe vera inside a bowl of cold water and remove any clingy substance from the aloe segments. (This step is necessary to avoid possible tummy upsets). 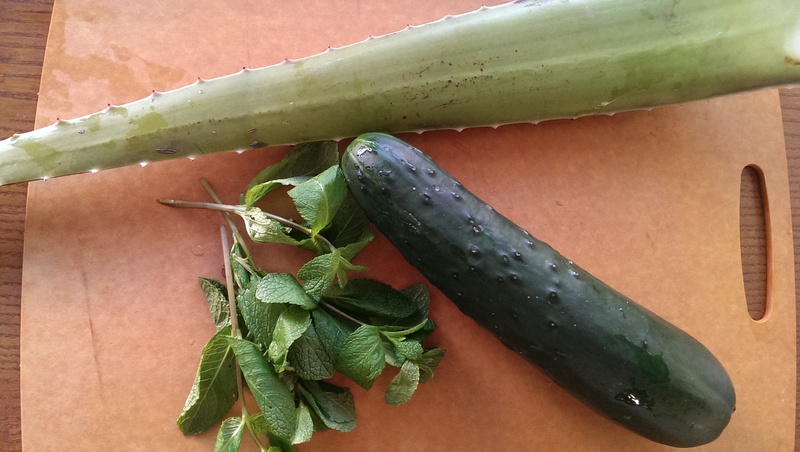 When properly cleaned; add the aloe, cucumber, lemon juice, agave nectar and mint leaves to an electric blender. Blend for 30 seconds. Add 2 cups of cold water and blend again for 30 seconds. Divide juice between 4 glasses or chill for up to 24 hours. * Aloe vera leaves can be purchased at most Asian grocery stores and some major grocery chains. Look for the largest blemish free leaf you can find as they have more jell to harvest for drinks.